For those of you who missed Pierce Pettis’s wonderful house concert about a month ago, he is coming back to town to do a “pro bono” benefit show for the Civic Media Center on Friday evening April 28. The location will be next door to the CMC in M.A.M.A.’s Place, a new addition to the block spearheaded by Faye Williams inside the old location of Citizens Co-op at 435 S. Main St. (Pierce is, as usual, on tour and this one night of availability corresponded to Art Walk, which the CMC was already booked for). Pierce is a veteran singer-songwriter with a great talent for heartfelt songs, great phrasing and a very entertaining presence, and this is a very kind gesture to waive his fee (this is how he makes his living) to help the CMC raise the funds it needs to keep going in these times we are in. It is kind of a reward for the over half dozen times I have set up shows for him in Gainesville over the last 20 years, including the old CMC, the current CMC, the Thomas Center and the Acrosstown Repertory theater. The concert will be at 8pm sharp, but since it is Art Walk night, you can come early and browse the downtown galleries beforehand. There is parking in the lot just south of the building, across the street on Main, or just north at the courthouse lot. Tickets will be $15 in advance and $20 at the door. More details from Joe at 352-378-5655 or gainesvilleiguana@cox.net. The Women’s March on Florida, Gainesville Chapter is organizing for upcoming challenges to protect our civil liberties. During their first few months, they have created a sustainable grassroots organization with a foundation to support resistance efforts and to ensure that the voice of progressive Americans who care about our environment, civil rights and equality are heard. WMFL is committed to supporting the causes you care about. Join the 400 volunteers as they work collaboratively with the local government officials and other grassroots organizations. Get involved by coming to one of their events, email them at womensmarchflgnv@gmail.com, and participate and like them on Facebook at https://www.facebook.com/wmflgnv. April 27 at 6:30pm Action Group & Volunteers Leadership mtg. The League of Women Voters – Alachua, in partnership with FL Sun, has a brand-new web page (you are among the first ones to see this!) that explains the Alachua County Solar Co-op. “I would not agree that [CO2] is a primary contributor to the global warming that we see,” Environmental Protection Agency director Scott Pruitt said in an interview with CNBC on March 9. A mere three weeks into his term as Donald Trump’s EPA cabinet appointee, Pruitt displayed an alarming level of ignorance about the field which he is supposed to lead. Unfortunately, Pruitt’s behavior is not uncommon in Washington. Over the past decade we have seen politicians attack science on all fronts. From funding cuts to gag orders to blatant denial our scientific community is plagued by a political body that largely ignores empirical evidence when it is inconvenient for their party affiliation or campaign donations. Veterans for Peace has, each Memorial Day weekend since 2007, assembled the “Memorial Mile” of grave stones along the stretch of NW 8th Ave running eastward from NW 34th St. Each grave stone holds the name, age, hometown, service status and date of death for an individual casualty in America’s wars in central and southwest Asia: the previous display showed 6,888 United States troops, with 63 more on the list for this year (so far). I know you’re busy. There are so many things competing for your attention, and it’s hard to keep up with all of the things happening in the world right now. Since the election, I’ve felt really overwhelmed. I’ve kept busy with community organizing, petitions, calling representatives, and going to every demonstration I could. I’m encouraged to see so many people taking up new fights and continuing old battles … but there’s one underlying issue that’s not getting enough attention. Nearly 1.7 million Florida citizens have lost the right to vote due to a felony conviction. This includes 23 percent of Florida’s black citizens. One-third of all arrests are drug-related and only one-forth of those who were convicted served any time in prison. Florida’s disenfranchisement rate remains the highest among the 50 states, and it is only one of three states, including Iowa and Kentucky, that impose a lifetime ban on felon voting unless restoration is actively sought. “Almost Sunrise” – a film about the remarkable journey of two Iraq War veterans – will be shown at the Hippodrome Theatre in downtown Gainesville on Monday, May 1, at 6:30pm. The film follows two Iraq War veterans, Tom Voss and Anthony Anderson, both tormented by depression after they returned home from the military and pushed to the edge of suicide. The two embark on an extraordinary journey – a 2,700 mile walk across the country from Wisconsin to California, in order to reflect on their haunting experiences of war and to ultimately, save themselves. Donald Trump is taking office as the only climate-change denying world leader and threatening to throw all that progress away. We’re ready to fight back. That’s why the People’s Climate Movement is seizing the first 100 days of the Trump Administration as our own and putting all of our energy toward stopping Trump’s attacks on our climate, our communities, and our jobs, and advance our vision of a new American economy that protects our planet and people. The Trump Train has left the station, and the trip is not gonna be pretty. Yesterday (4/7/17) came the news of 59 Tomahawk missiles launched into Syria, and the confirmation of Neil M. Gorsuch to the Supreme Court, bypassing the 60 vote requirement. Today we had Jacksonville police allowing a disruptive agitator to continually provoke a peaceful protest, then, when the agitator succeeded in provoking someone, cops jumped in and arrested six people. We as a society have lost the skill and patience of diplomacy and negotiation. The people who think in terms of winning instead of cooperation have seized the controls and we are steaming down the tracks. What started out as a Poetry Reading in 1979 took place with a purpose: to celebrate the rich cultural heritage of the African American community and to sound the alarm that gentrification was coming. The first 5th Avenue Arts Festival was held. The complexion and the culture of NW 5th Ave., along with Porters Community have changed so very much over this 38-year period. Mom’s Kitchen – a thriving community – is gone, along with Seminary Lane and hundreds of its residents. Yet, our message through the many years and themes has remained the same. 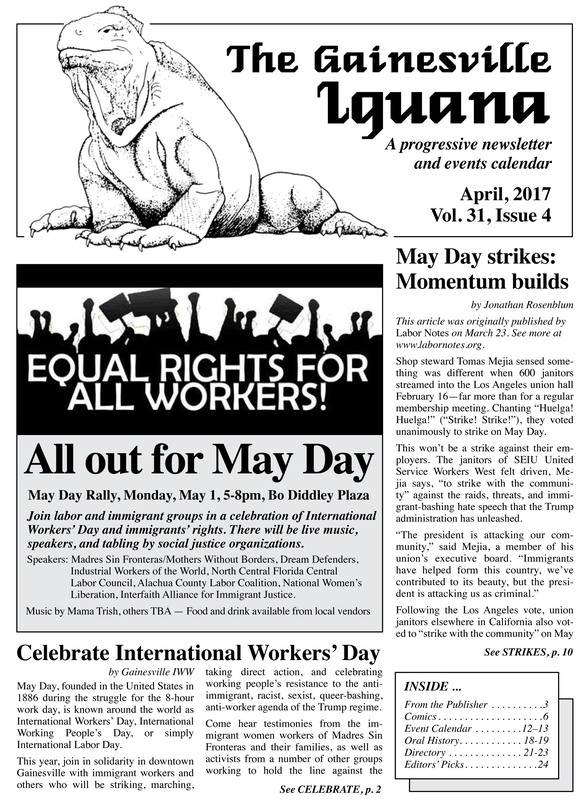 Join labor and immigrant groups in a celebration of International Workers’ Day and immigrants’ rights. There will be live music, speakers, and tabling by social justice organizations. Speakers: Madres Sin Fronteras/Mothers Without Borders, Dream Defenders, Industrial Workers of the World, North Central Florida Central Labor Council, Alachua County Labor Coalition, National Women’s Liberation, Interfaith Alliance for Immigrant Justice. May Day, founded in the United States in 1886 during the struggle for the 8-hour work day, is known around the world as International Workers’ Day, International Working People’s Day, or simply International Labor Day. 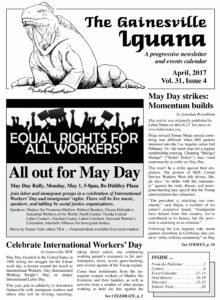 The 2017 April issue of the Iguana is now available! If you want to get your hands on a hard copy, check out our distro locations here.